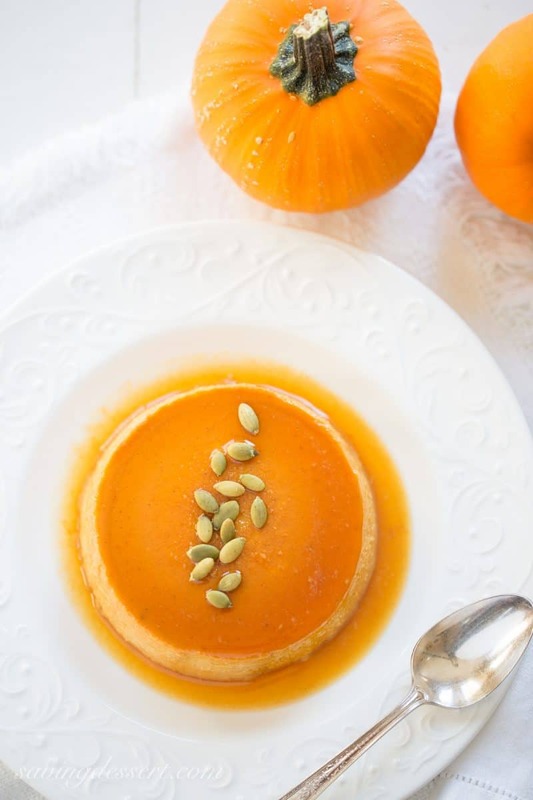 Pumpkin Caramel Flan – a silky smooth, creamy custard loaded with pumpkin, and pumpkin pie spice, with a layer of soft caramel on top. I’m feeling very blessed tonight. As I write this post I think back to my day and how excited I was, because I knew our children, and their spouses, and all the grand-babies would be coming over. On the first Sunday of each month we host a family dinner. It’s a special day for us because getting together as a family was actually their idea. How great is that? They’re adults now so we all sit and talk, laugh and share stories. We talk about how much their children remind us of when they were little. Oh the memories. We looked ahead to the holidays, planning our family Thanksgiving dinner, a photo project involving the granddaughters for Christmas, and we scheduled our family holiday picture. Baby Jayden tried pears tonight for the very first time. It was the first time she has eaten any kind of fruit in her whole life (7 months) and we all got to see her wonderful reaction! My heart is full. These are the best of times. First of all, can you guess what I served for dessert at our Sunday family dinner? Our daughter-in-law Callie likes Pumpkin Pie but there are only a few of us that eat it. Everybody else wants Chocolate Pecan Pie for the holidays. So, I thought I’d sneak in one more pumpkin recipe (for Callie), with my very last can of pumpkin, before the holiday extravaganza got away from me. 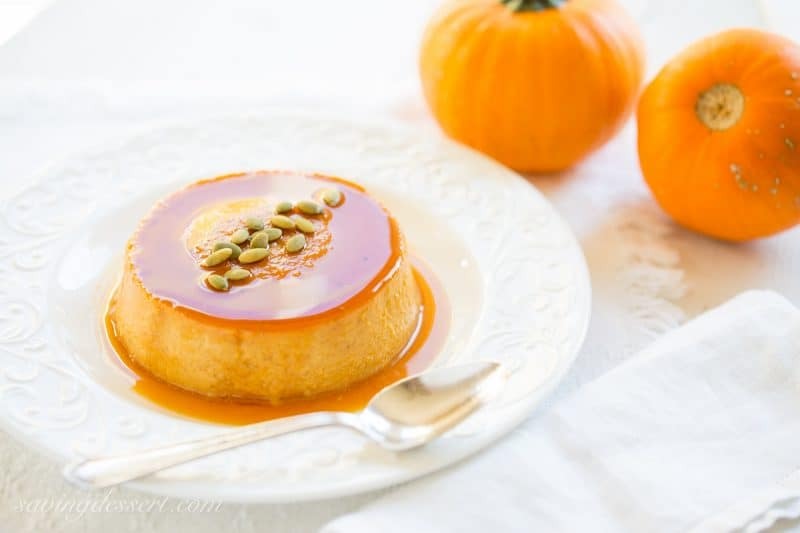 Caramel Flans, and this pumpkin version, are super easy to prepare and are especially great because they must be made ahead of time. 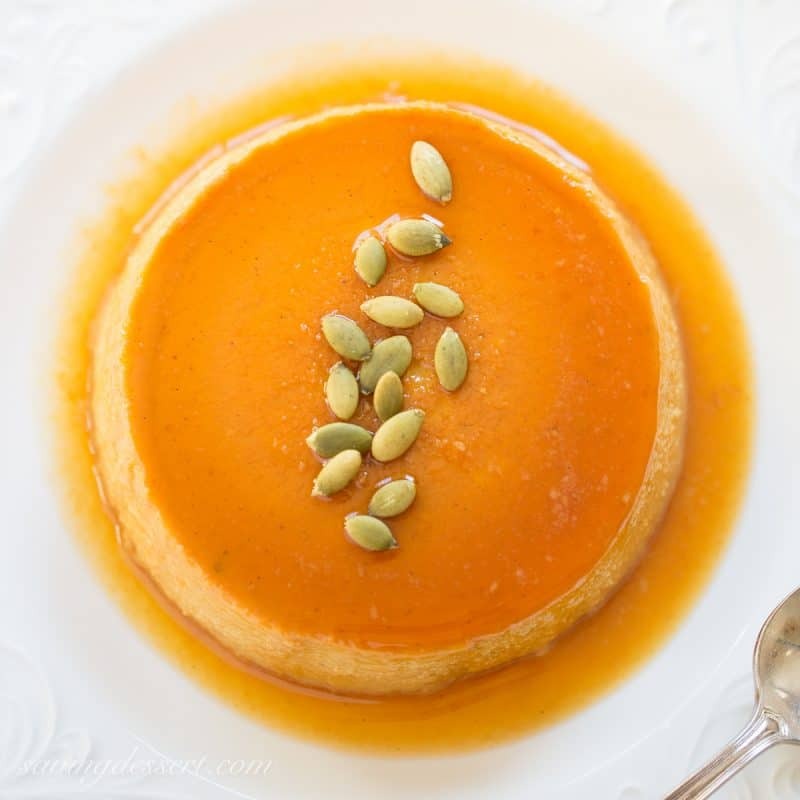 That makes this Pumpkin Caramel Flan a great dessert for a crowd or even a pumpkin loving daughter-in-law. Several years ago one of my former coworkers gave me her authentic Mexican Caramel Flan recipe. I decided to try and adapt it by substituting pumpkin for the cream cheese, added pumpkin pie spice and exchanged the vanilla for vanilla bean paste. In addition, I switched one of the whole eggs for an egg yolk, and added one more just for good measure. Finally, the texture of the Pumpkin Caramel Flan was spot on with a subtle, not too sweet, pumpkin flavor. I garnished the individual flans with roasted, salted pepitas which is a great contrast to the soft caramel. The recipe may be baked in a 1 1/2 quart baking dish, an 8 or 9-inch cake pan, or in an assortment of ramekins. Don’t forget to PIN to your favorite dessert board! Flan must be baked in a bain-marie, or hot water bath. Prepare a larger pan big enough to hold 6-8 ramekins, a 1 1/2 quart casserole dish or an 8-9" cake pan. Place the pan with the empty ramekins or casserole in the oven to preheat while preparing the caramel. In a small nonstick saucepan, warm the granulated sugar over medium heat. Shake and swirl the pan occasionally to distribute the sugar until it dissolves and starts to color. Once almost all the sugar is melted, turn the heat down to medium-low and continue swirling the pan until the caramel turns dark golden brown. You can slow the cooking process by lifting the pan over the heating element (4-6 inches) if you are worried it's browning too quickly. You don't want it to burn because it will have a very bitter taste. Once browned, divide the caramel between the preheated ramekins or pan. Set aside to cool while preparing the custard. Heat a kettle of water to boiling and set aside. Place all remaining ingredients (except pepitas) into a blender and process on high for at least one minute. Divide the custard between the ramekins. Place the pan holding all the ramekins in the preheated oven. Carefully pour hot water into the pan to about 1 inch in depth. Close the oven and bake for 60 minutes or until the custard is set. Cool completely, then cover and refrigerate until ready to serve. The flan should be fully chilled before serving. To serve, slide a small sharp knife around the edge of the dish. Shake the ramekin back and forth until you hear the custard pulling away from the sides of the dish. Invert the flan onto a plate to serve. Garnish with pepitas if desired. You may need to use 6-8 ramekins depending on the sizes. I have two large, 6-inch ramekins, several 4-inch and some 3-inch. I used an assortment of different sizes but all baked the same. Happy Monday my friends. I hope you have a wonderful week and thanks so much for stopping by! Is it important to use evaporated milk? May I pour regular milk? Hi Julie – I think evaporated milk will work best in this recipe. You can try regular milk but I’m not sure it will come out the same. I have not tested it using milk. Evaporated milk has a richer taste so I would use whole milk if substituting. Good luck! Oh Tricia. I am so happy for you! You are blessed. What I would give for family dinners-but mine have not yet come home to roost. I do believe though that one day they will. And I promise I will serve this. 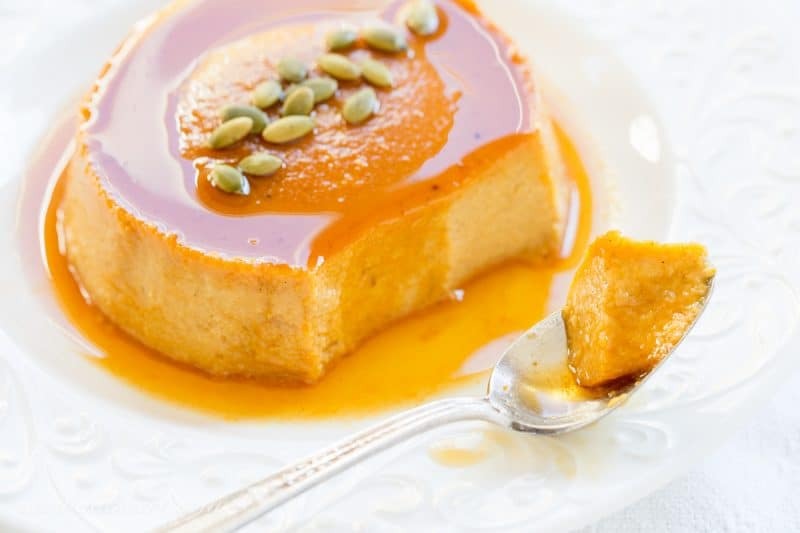 I love flan and am sure I would love pumpkin flan, too! What a sweet post about your family, Tricia. I feel the same with a full heart and joy when we get together. This is such a beautiful dessert and the texture looks just perfect. Great idea to add the pepitas on top too! You are so blessed to have all your family nearby and growing! Your flan looks and sounds amazing and your photos arr unsurpassed! Wish we were neighbors !! Thanks so much! I wish we were neighbors too – what fun! Have a great week. Such a beautiful post to read, Tricia. Your images and words warm the heart. I had to chuckle when I read about your chocolate pecan pie because one of the few times I baked I decided to do a white chocolate pecan pie for Christmas and a neighbour and I decided to do two of each and exchange so we would have more desserts available. She made these amazing chocolate coconut rum balls and when she saw my sad little pie I knew she regretted the deal we made, hahaha! We still laugh about it. You are the sweetest Robyn. I truly hope we get to meet in person some day! I want to give you a big hug and bake something for you! I’m sure your chocolate pecan pie was terrific 🙂 But that is a funny story! Have a lovely week. How wonderful , having all your children with their families to gather around the table once a month. The flan looks wonderful and pinned it to make it before the holidays are over. It is pretty wonderful Gerlinde – we feel very lucky. Hope you love the flan as much as we did! We really are lucky Betty. Hope you are enjoying this school year and I’m sure you’er looking forward to the holidays. Thanks so much! What an absolutely perfect way to end your special dinner! I love flans and the pumpkin flavour must be wonderful 🙂 You are blessed indeed. Thanks Jennifer – we are having some fun with these grandchildren. It really is a blessing. Perfect ending to a delicious meal, Trish! Thanks for sharing, it looks great! Thanks Pam – hope you’re doing great! Sounds like you had a wonderful day with the family, I love our family times as well and treasure each and everyone. Beautiful flan, how sweet of you to make it for your daughter-in-law. Take care! My husband is a flan freak, and I’m a pumpkin freak, so this has to happen in our house soon. That glossy surface is magical! Thank you Sue 🙂 Sounds like you should make a flan for Grant! I know your kids look forward to these family dinners all month. And yes grand babies make everything more special. The flan looks amazing, bet it got gobbled up! I sure would do some gobbling! But since I can’t pull it off my computer screen, I’ll pin and share it for everyone to enjoy! You would have a pretty big crowd at a family dinner at your house. All those beautiful grandkids! Thanks so much Chris – have a wonderful week! Such a wonderful dessert to end a meal! These family meals have to be amazingly delicious and this is one special dessert – the flan is just beautiful! I’m so glad you have such an amazing growing family to cook and bake for. How lucky are they! !